Residents of Hampton enjoy beautiful beachside living, but this comes at a cost, with heavy sea breezes bringing all kinds of leaves, twigs and rubbish into the gutters of surrounding homes. Cleaning your gutters can be an easy thing to forget to do, which is why hiring a professional gutter cleaner in Hampton is essential. Hiring a pro means the job is not only done quicker and more thoroughly, it also means you don’t have to spend your weekend up on a slippery roof when you’d much rather be doing anything else. 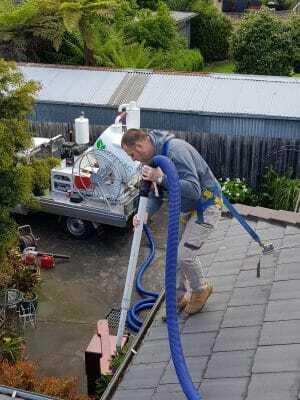 LeafVac is a family owned Melbourne company who can take the trouble out of gutter cleaning for you. Our expert staff are fully trained and qualified, using the highest safety measures to complete your gutter cleaning job with upmost care and respect for your property and privacy. We use the latest technology and a high-powered vacuum excavator machine to clear your gutters of all debris with no mess and no fuss, ensuring there are no blockages in your gutter and eliminating problems that can lead to rust, leaks and damage to the structure of your property. We pride ourselves on delivering high quality, long lasting results and are so proud of our work we’ll even provide you with a before and after photo, so you can see just how effective our gutter cleaning service is. If you’re looking for a reliable, professional gutter cleaning service in Hampton, contact LeafVac today on 0455 488 837 and book your job with an expert you can trust.